Classes are a funny thing. You go in, teaching a technique and the students learn. Sometimes a student goes off on their own, takes your materials, and comes up with something completely different than what they signed up to do. I love it when they feel comfortable enough to go outside of the box. 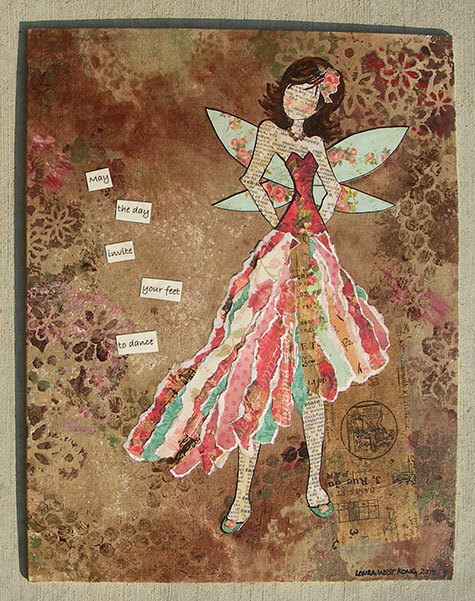 This particular student, Laura West Kong, came up with this absolutely gorgeous fairy design. I love the way she layered her papers, incorporating bits and pieces into the torn strips that I instructed them to do. Students always ask if they should tear the paper so the white doesn't show. I love the white part showing as it adds texture. Laura's fairy skirt shows a lot of white and I think it added to the ethereal look of her skirt.﻿ I learned that Laura is an incredible quilt artist and you can see some of her work on her blog. Sorry, her blog wouldn't link but if you search her name, it will come right up. I can't help but wonder if there's a fairy quilt in her future. Maybe torn strips of fabrics with lots of yummy fibers thrown in? wow this is amazing. I just received your book Friday. It was on my christmas list and I begged hubby to let me have it early. I've been drawing for 4 days and they still look terrible! arrrgghhh!